Once Dominaria comes out, Sage of Lat-Nam will have been printed in three different sets, with a different rarity each time. It’ll be an uncommon this year, while it was a rare in the Eighth Edition and, amazingly, a common in Antiquities. To be fair, Antiquities was mostly artifacts to a degree that even Mirrodin didn’t quite reach! Dominaria has a pretty good share of artifacts, though, and the Sage will surely be a good play in limited at the very least. You’ll get benefits from the creatures that look for castings of historic spells, and you’ll get value out of at least one of the subset of historic spells later on if they’re about to be destroyed or lose in combat. I also want to see what he does in Standard during the time Dominaria shares with Kaladesh – it might not be strong enough to go toe-to-toe with The Deck Formerly Known As Ramunap Red, but it could well be worth playing for fun. In the novel The Brothers’ War by Jeff Grubb, we learned that the College of Lat-Nam was Dominaria’s foremost institution for the study of magic in Urza and Mishra’s day. 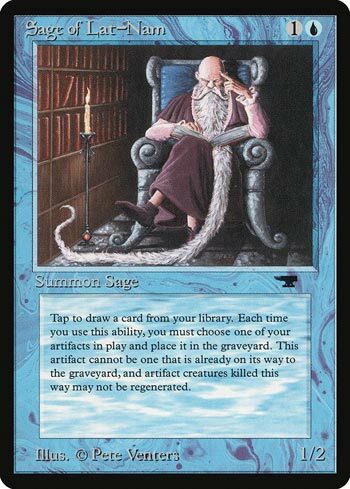 Once the brothers went to war, everything was drawn into it in some form, and the college did not survive; but its lineage continued, and Urza’s own Tolarian Academy and its successors were strongly influenced by it. As a university person myself, I’m quite partial to it, although I’m the first to admit that Tolarian Academy was and remains a bad influence! Thank you Oracle. It’s shocking how much card text has been stream lined and improved. The latest printing reads “Tap: Sacrifice an artifact. Draw a card.” The ability is pretty good. Recycling a treasure token for a card is a good trade. Good news is that there are quite a few artifacts that trigger when they get scrapped. Solem Simulacrum for example will let you draw 2 cards. Artifact lands are also great targets in the formats that support them. Sage of Lat-Nam needs the right home to shine but he is a fun card none the less. Despite a printing in Dominaria, Sage of Lat-Nam actually dates back to Antiquities, as you can see from the card image for the day. He’s pretty straightforward: bin an artifact, draw a card. And this is in a format with abundant Treasure tokens to be had, and a couple of artifacts otherwise to boot. Sage of Lat-Nam definitely has value as an extra, cheap source of card advantage, a way to turn your Treasure into more power, but I feel like he’s consigned to a role as a bit-player as a result.